Tic Tac Trance #046 Replay available! It’s almost time again for another episode of Tic Tac Trance! 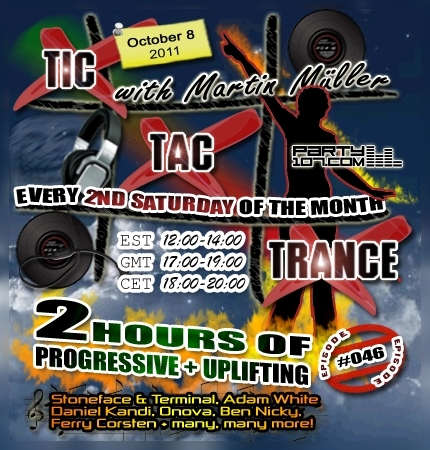 Episode #46 will air on October 8 2011 and will feature two hours full of my current favorite trance & progressive tunes. You can expect music from artists like Stoneface & Terminal, Adam White, Daniel Kandi, Onova, Ben Nicky, Ferry Corsten and many, many more! Don’t forget to tune in!